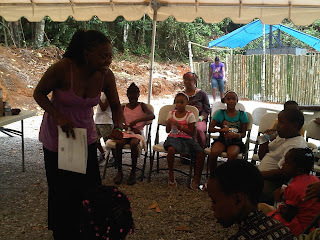 The Asante Adonai Literary Lyme held on May 22 in Winefield, St Ann gave as much attention to the Children's literary programme "Once Upon A Lyme" as it did the big stage, and their patrons loved it. 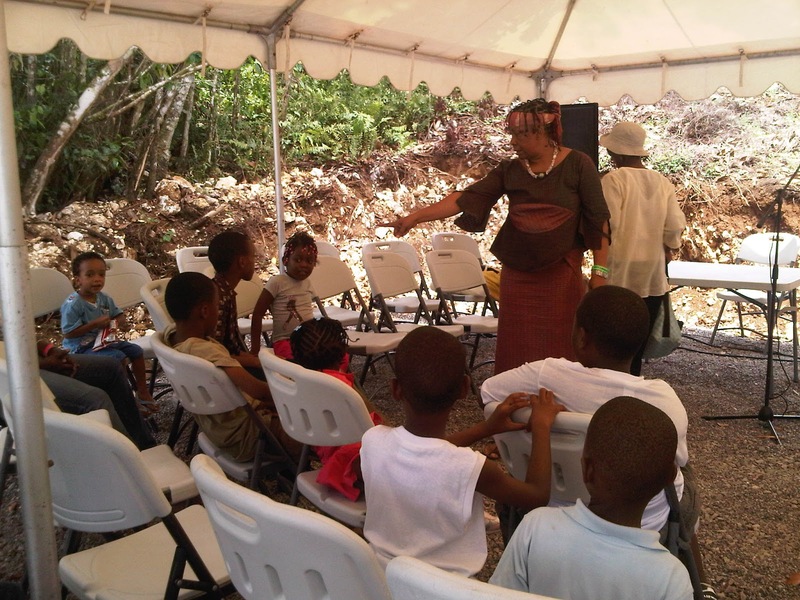 Set on its own small hillside, well within view of most parts of the venue, storyteller Amina Blackwood Meeks, managed a day of activities for children from ages 3 to 12. Every activity on the programme was related to the reading and expression of the spoken word. The experienced Blackwood Meeks engaged the children in fun activities such as riddles, and told Ananse stories with the storytelling 'sandwich' that starts, Crick Crack Break My Back, and ends Jack Mandora, me no choose none: traditional storytelling tools to let listeners know that this is just a story for you to learn, and not an encouragement for you to go and do wrong. Blackwood Meeks told the story of Ananse and the Snake. The children were also able to go centre stage and contribute their own words through riddles: Sun burning hot on you; replace you with I, what do you get? Answer, sin. The readers who read from their own work had different styles, but each style allowed them to connect with the children and hold their attention during the short, and very focussed, presentations. Tukulah Ntama got the children involved in craft by making a scrapbook book that they would later fill with their own words and collages. 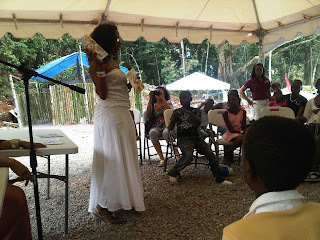 Children's author, Tanya Batson Savage, expressively read the story of Primrose and the River Mumma from her book, Pumpkin Belly and Other Stories. A story that truly invites imagination. 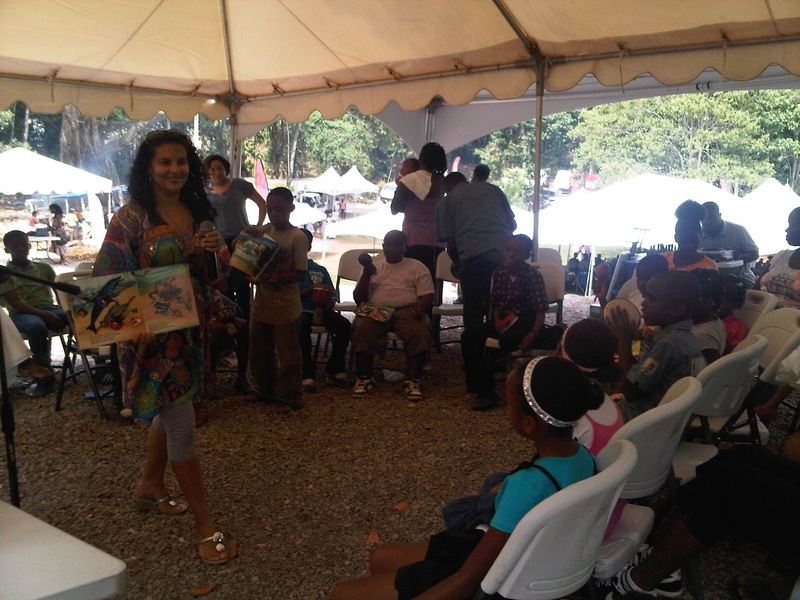 There was action when Kellie Magnus read from Little Lion Goes For Gold, the third in her series of Little Lion books. The book anticipates the excitement of the Jamaican athletes in the upcoming Olympics and other premier athletic events. Jana Bent played the CD that goes with the audio book and music compilation , Shaggy Parrot and the Reggae Band - a book that promotes respect for the natural environment. With additional sound effects provided by the wild parrots of Asante Adonai, Bent and her team of two children artfully moved around showing the pages of the books in time with the storytelling. Auntie Margaret was on hand in the tent to help the younger children, and at appropriate breaks, the children were refreshed with bottled water from Wata, and St Mary chips by Caribbean Producers. 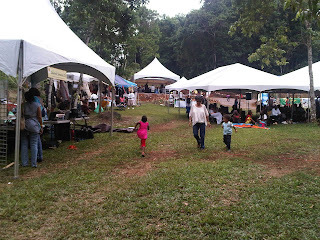 Books by the authors were on sale on site by book vendor, Bookophilia. That store also carried a range of Caribbean themed children's books on sale. The children who were old enough to stay unsupervised by their parents seemed to be very accustomed to a story telling and story reading atmosphere. They followed instructions readily, and sometimes even anticipated them. The group grew no larger than 30 children at any one time and there were slightly more boys than girls in attendance. The The Asante Adonai Literary Lyme is the first event at that venue which expects to attract retreats and celebrations in a natural environment.